These Tasks are the second set of Tasks to be released by Jagex. While the easy tasks may be completed by both members and freeplayers, Rat Burgiss cannot be interacted with on non-member servers, and therefore the rewards can only be collected by members. Talk to Rat Burgiss in the south of Varrock, Reldo in the Varrock Library or Vannaka in the Edgeville Dungeon. 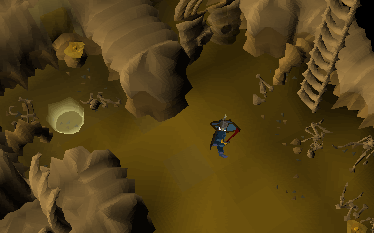 Rat is located south of Varrock at the crossroads northwest of the Al Kharid mine. 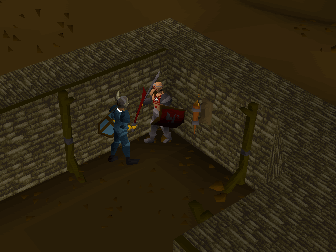 Reldo is in the Varrock Castle in the large room on the first floor to the north. Vannaka is one of the Slayer Masters and is in the Edgeville dungeon in the northeast corner of the southern half of the dungeon. When you have a choice of what to ask them, choose the option that asks them what Tasks are. Once they finish explaining, you may start on any task. 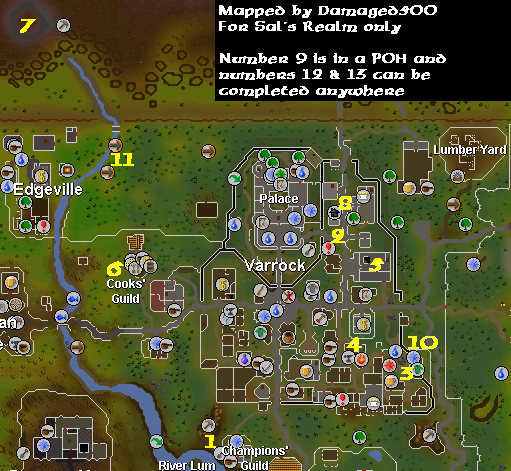 Do the tasks in this order: 11, 5, 10, 17, then teleport to Varrock and do 8, 1, 2, 13, 18, 12, 15, 19, 4, 7, 14, 16, 3, 6. 1. 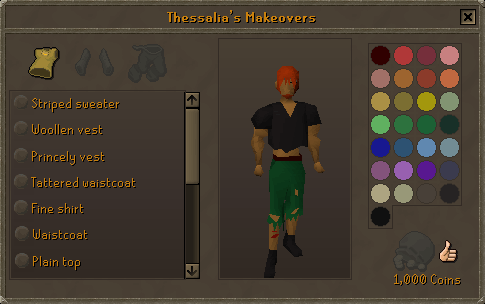 Have Thessalia show you what outfits you can wear - Talk to Thessalia in her clothing store just west of the General Store and select the 'change clothes' option by right clicking. 2. 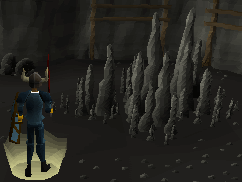 Have Aubury teleport you to the essence mine - Travel to Aubury's Rune Shop in southeast Varrock, right-click and select the 'Teleport' option. Requires completion of Rune Mysteries quest. 3. Mine some iron ore in the Mining spot, south-east of Varrock - Walk out of Varrock by the east entrance, then walk south until the city wall ends, enter the mine area and mine some Iron ore.
4. 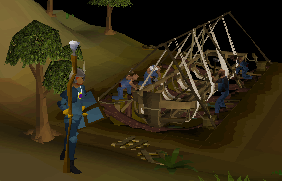 Make a plank at the sawmill - Bring either a plain set of Logs, or Oak, Teak, or Mahogany logs and at least 100gp to the Sawmill Operator northeast of Varrock. 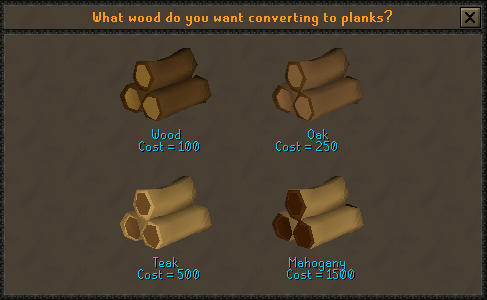 Plain logs are the cheapest plank to make with their price of only 100gp per plank. 5. Enter the second level of the Stronghold of Security - Travel to the Stronghold of Security under the Barbarian Village and descend down to the second level. Refer to the Stronghold of Security dungeon guide for detailed maps. 6. 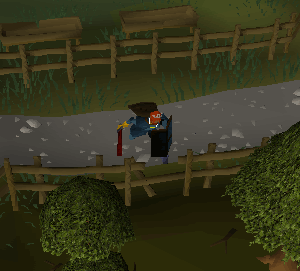 Jump over the fence, south of Varrock - Jump over the break in the fence west of Rat Burgiss, south of Varrock. 7. Chop down a dying tree in the Lumber Yard - Climb over the fence and chop down a dead tree. There is one as soon as you get in that you may cut. 8. 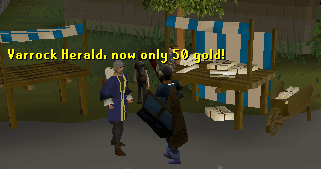 Buy a copy of the Varrock Herald - Buy the Newspaper from Benny in Varrock Center for 50gp. 9. 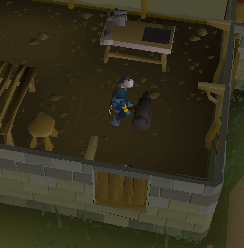 Give a stray dog a bone - Find one of the stray dogs in Varrock and use a set of bones with it. 10. Make a bowl on the pottery wheel then fire it in the pottery oven, all in the Barbarian Village - Use Soft Clay with a pottery wheel, then fire it in the oven. You must make and fire it in Barbarian village or it will not count. 11. 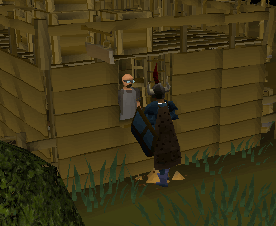 Enter Edgeville Dungeon using the entrance to the south of Edgeville - Simply enter the Edgeville Dungeon to the south of the Edgeville bank. 12. Move your player-owned house portal to a different location using the Varrock estate agent's - Bring at least 5,000gp and talk to the Real Estate Agent just east of Varrock Castle to move your house to a different location. You must have already bought a house to move its location. If you don't have one yet, buy it now. 13. Speak to Haig Halen after obtaining at least 50 kudos - Talk to the Museum Curator Haig Halen on the Varrock's Museum ground floor once you have at least 50 kudos. 14. Enter the Earth Altar using an earth tiara or talisman - Simply enter the Earth Altar while either wearing an Earth Tiara or having an Earth Talisman in your inventory. 15. 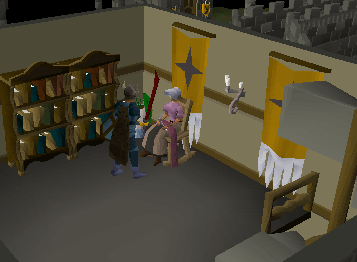 Have Elsie tell you a story - Elsie is waiting for you on the second floor of Varrock's church. You must bring her a Cup of Tea to hear one of her stories. You may steal a cup of tea from the Tea Stall southeast of the east bank. 16. Mine some limestone near Paterdomus, the temple to the east of Varrock - Exit Varrock by the east entrance and walk northeast, through a gate and keep going until you see a path leading north. Here is where you can mine Limestone. 17. Catch a trout in the river to the east of Barbarian Village - Fly-fish in the river east of the Village until you catch a Trout. Make sure to bring more than one Feather as you may not catch a Trout on your first try. 18. 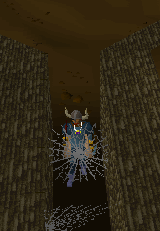 Venture through the cobwebbed corridor in Varrock Sewers - Once you have entered the Sewers, take the northeastern passage to the end, then go north and around the curve to the west. Head down the passage to the south, slash the web, and then walk just beyond the web's remains to complete the task. 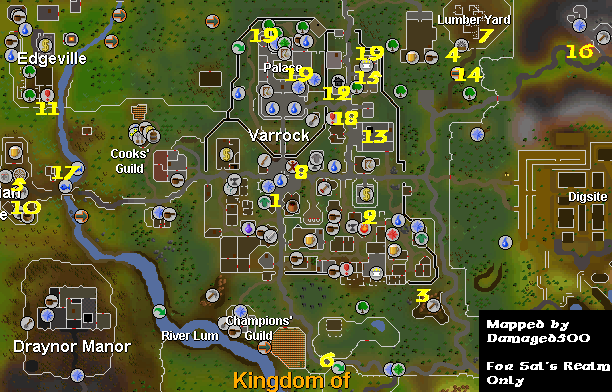 See the Varrock Sewer guide for a map. 19. Find the highest point in Varrock - Walk up the main staircase just inside Varrock Castle's main entrance, walk up the ladder to the east, then go up the next set of stairs to reach the highest point. You can also climb to the Church's third floor one floor above Elsie to reach the other highest point in Varrock. There is also a third highest point up Varrock Castle's northwestern tower. After completing every Easy task, you can return to Rat Bugiss to get rewarded for your achievements. If you ever lose your armour, simply talk to Rat to get it back again. 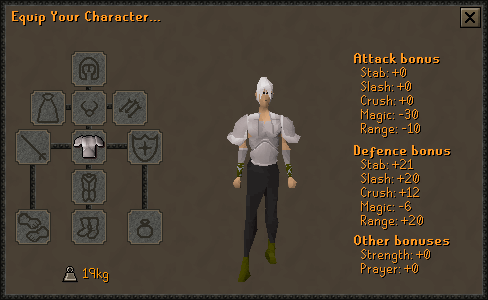 Rat will give you the Varrock Armour 1. While wearing the armour there will be cheaper buying and higher selling prices from certain Varrock stores (see charts below). 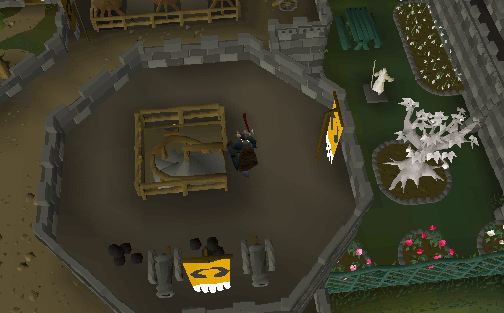 You can speak to Rat to change your Varrock Teleport location to the Grand Exchange. 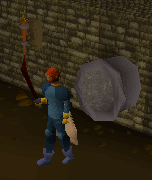 When smithing at the furnace in Edgeville and wearing the armour you have the chance of smelting two bars at once up to and including Steel Bars. When you mine while wearing the armour, you get the chance to mine two ores at once up to and including Coal. An Antique Lamp which will give 1,000 experience to a skill of your choice at least level 30. 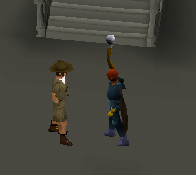 Ability to speak to Rat Burgiss to change your Varrock Teleport location to the Grand Exchange. Note: These prices were taken at the store's default and may vary slightly. 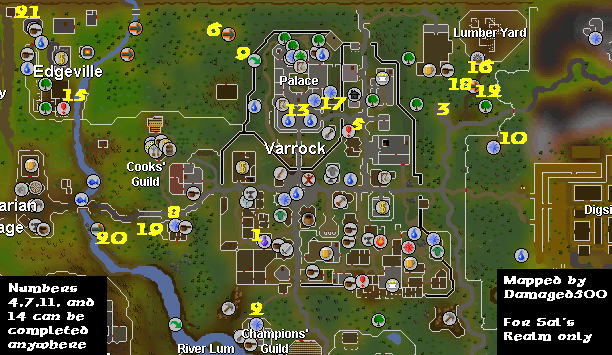 Do the tasks in this order: 21, 15, 6, 9, 13, 17, 5, 3, 16, 12, 10, then teleport to Varrock(14) and do 1, 2, 8, 19, 20, 11, 7, 4. 1. 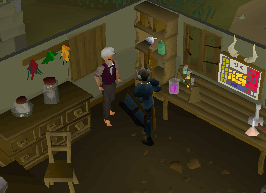 Have the Apothecary in Varrock make you a Strength potion - Bring a limpwurt root, red spider eggs and 5gp to the Apothecary southwest of the general store and ask him to make you a Strength Potion. 2. Enter the Champions' Guild - Walk to the Champions' Guild southwest of Varrock and enter it. You must have at least 32 Quest Points to enter. 3. 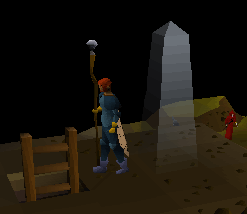 Take the Dagon-Hai shortcut to the chaos portal - Bring a Chaos Tiara or Chaos Talisman and enter the hole in the statue northeast of Varrock. Follow the passage north until you reach a portal and then go through the portal. You must have started What Lies Below to use this shortcut. 4. Get a full complement of rats on your rat pole - Start Rat Catchers and have your cat catch 6 rats after you have been given the Rat Pole. Once your cat catches 6 mice and you have added them to your Pole, the task will be complete. 5. 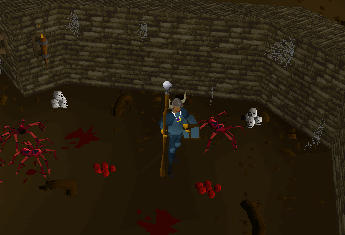 Escape from the spider lair in Varrock Sewers with some red spider eggs - Venture into Varrock's sewers, head toward the large room in the west past the cobwebs, take some Red Spider Eggs and then either teleport or walk out. 6. 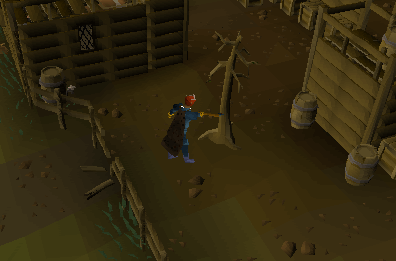 Use the spirit tree north of Varrock - Just a little ways northwest of the Varrock Castle wall agility shortcut is the Spirit Tree. 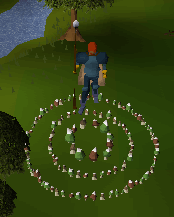 Teleport using the tree to complete this task. 7. Perform the four emotes from the Stronghold of Security - Do the 'Idea', 'Stamp', 'Flap', and 'Slap Head' emotes. You must have claimed the rewards from all levels of the Stronghold of Security to do all of them. 8. Select a colour for a new kitten - While wearing your Ring of Charos(a), buy a new cat from Gertrude for 100gp and if you select the Charm option while speaking with her, you will be able to choose your kitten's color. 9. 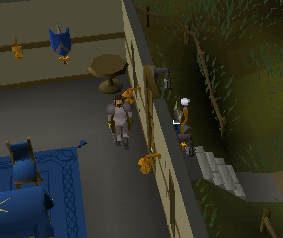 Use the shortcut under the west wall of Varrock Palace - Walk over to the west wall of the Varrock Palace and about halfway to the end of the wall is a shortcut that goes under the wall. 10. Enter the A Soul's Bane rift - Leave Varrock by its east entrance and then walk northeast like you are going to Canifis. Once you are just past the gate, head slightly southwest to reach the rift. If you haven't already started A Soul's Bane quest, you will need a Rope to enter the rift. 11. Teleport to the Digsite using a digsite pendant - Rub your Digsite Pendant. You will appear somewhere to the north of the site where you might see a boat under construction to be used in an upcoming update. 12. Craft an earth tiara on the Earth Altar - Go to the Earth Altar northeast of Varrock and use your tiara with the Altar to fuse it with you Earth Talisman and turn them into an Earth Tiara. 13. 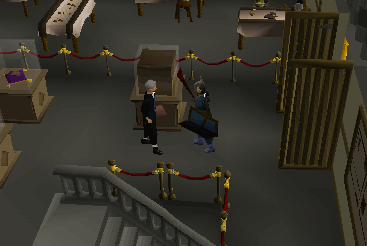 Pickpocket a guard in the Varrock Palace courtyard - Just pickpocket any guard in the Varrock Castle courtyard (the area just before the castle). 14. Use the Teleport to Varrock spell - Use the Varrock Teleport spell. Teleportation tablets will not work for this task. 15. Get a Slayer task from Vannaka - Talk to Vannaka in the Edgeville Dungeon and tell him you need a new assignment. 16. 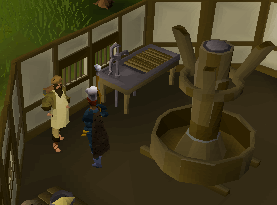 Buy twenty mahogany planks from the Sawmill Operator in one transaction - Go to the Sawmill northeast of Varrock and bring twenty mahogany logs and 30,000gp. Let the Sawmill Operator convert your logs into planks to complete the task. Make sure have exactly twenty before buying the planks or you will have to repeat it again. 17. 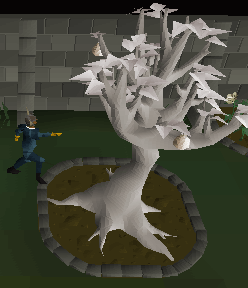 Pick a fruit from the White Tree - Go to the Garden of Tranquillity on the east side of Varrock Castle and pick a fruit off of the White Tree. 18. 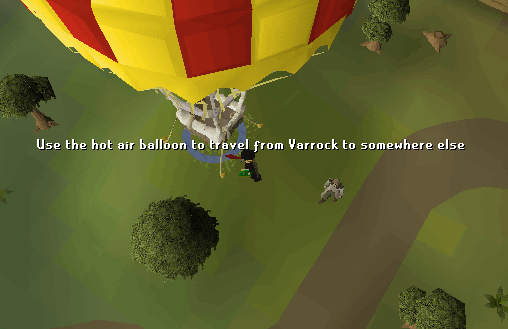 Use the hot air balloon to travel from Varrock to somewhere else - After completing Enlightened Journey, fly the Hot Air Balloon from Entrana to Varrock. Then use the hot air balloon northeast of Varrock to travel anywhere else the balloon can go. 19. Get a cat training medal from Gertrude - Have your pet kitten or pet cat kill 100 rats, then speak with Gertrude. If you have already gotten the Cat Training Medal, you will need to raise a new cat and kill 100 rats with your new pet to complete this task. It's recommended to raise a kitten into a cat since cat's have a much higher percentage of catching rats. 20. 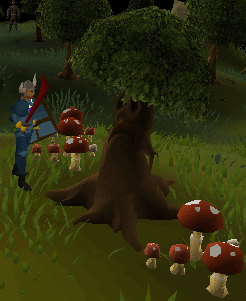 Dial to the fairy ring west of Varrock - Use any one of the fairy rings to transport to the ring south of the Edgeville canoe station. Its code is DKR. 21. 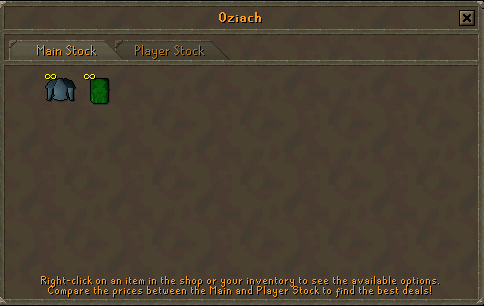 Browse through Oziach's Armour Shop - Teleport or walk to Edgeville and trade with Oziach in his house just west of Edgeville. After completing every Medium task, you can return to Reldo to get rewarded for your achievements. If you ever lose your armour, simply talk to Reldo to get it back again. 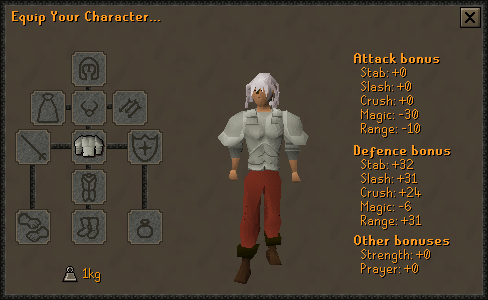 Reldo will give you the Varrock Armour 2 . When smithing at the furnace in Edgeville and wearing the armour you have the chance of smelting two bars at once up to and including Mithril Bars. 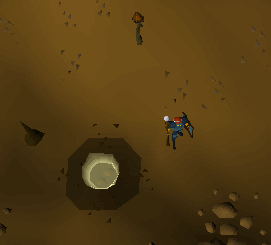 When you mine while wearing the armour, you get the chance to mine two ores at once up to and including Mithril Ore.
An Antique Lamp which will give 5,000 experience to a skill of your choice at least level 40. Ability to speak to Reldo to change your Varrock Teleport location to the Grand Exchange. Do the tasks in this order: 2, 8, 5, 4, 10, 3, 1, 6, 13, 12, 11, 7, 9. 1. 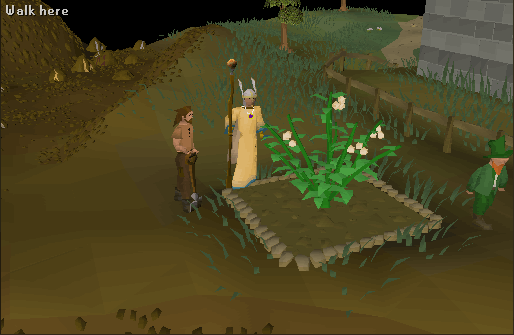 Pick poison ivy from your bush Farming patch in Varrock - Plant a Poison Ivy bush in the Varrock farming patch. Let it grow and then pick from it. Requires level 70 Farming. 2. 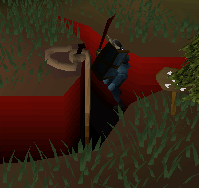 Use the pipe shortcut in Varrock Sewers, near the moss giants - With level 51 Agility, crawl through the Obstacle Pipe in the Varrock Sewers to get into Edgeville Dungeon. 3. 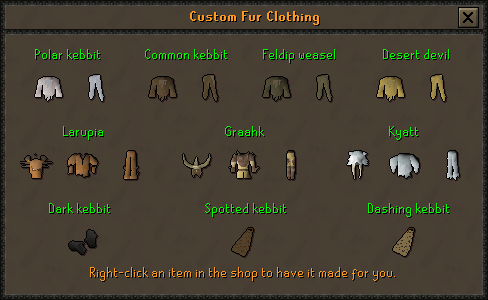 Trade furs with the Fancy Dress Seller for a spottier cape - Bring two Dashing Kebbit Furs and 800gp to the Fancy Dress Shop east of Varrock's smaller bank. You do not need Hunter level 66 to make this, as all it asks you to do is simply make the cape and the furs can be traded from another player. 4. 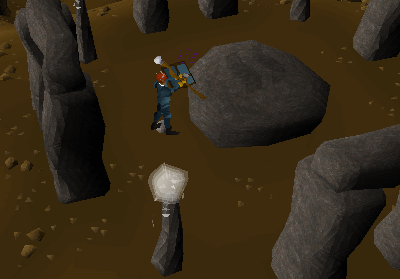 Smith an adamantite medium helm on the south-east anvil in Varrock, next to Aubury's Rune Shop - Bring one Adamantite bar and a hammer to the anvils next to Aubury's Rune Shop and Smith an Adamantite Medium Helm with level 73 Smithing. 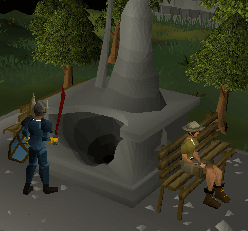 You may use a Smithing stat booster and complete the task, however the Assist System doesn't work. 5. 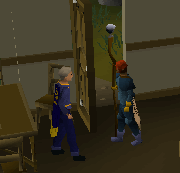 Speak to Orlando Smith when you have achieved 153 kudos - Go to the Varrock Museum after you've completely completed the Varrock Museum mini-quest and talk to Orlando Smith downstairs in the Museum. 6. Talk to Romily Weaklax and give him a wild pie - Bring a Wild Pie to Romily Weaklax, the pie seller in the Cooks' Guild. The pie can be made, or traded from another player. 7. 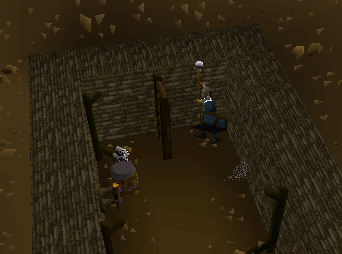 Craft an air battlestaff - Bring an Unpowered Orb, a Battlestaff, 3 Cosmic Runes and 30 Air Runes to the Air Obelisk in Edgeville Dungeon and craft an Air Battlestaff. 8. Give your player-owned house a fancy stone or tropical wood finish at the Varrock estate agent's - Talk to the Varrock Estate Agent and change your Player-Owned House a fancy stone or tropical finish. The fancy stone finish costs 25,000gp and the tropical finish costs 15,000gp. 9. Make a Varrock teleport tablet on a mahogany lectern - Bring some Soft Clay and one set of Varrock Teleport runes to a mahogany lectern in a Player-Owned House and create a Varrock teleport tablet. 10. Obtain a new set of Family Crest gauntlets from Dimintheis - Complete Family Crest to receive the gauntlets, or if you have already completed the quest and have the gauntlets, destroy them and get a new set from Dimintheis. 11. 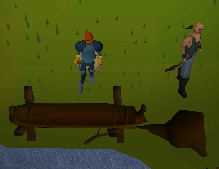 Make a waka canoe near Edgeville - Bring any hatchet to the Edgeville canoe station and cut yourself a Waka Canoe with level 57 Woodcutting. See the Canoe guide for more details. 12. Use the Home Teleport spell in the Ancient Magicks spellbook to teleport to Edgeville - Complete Desert Treasure, and have the Ancient Magicks spellbook instead of the regular Magic spellbook. 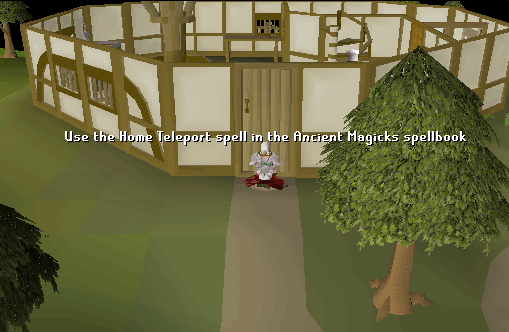 Simply use the Home Teleport Spell and you will get teleported to Edgeville. This spell requires no runes. 13. 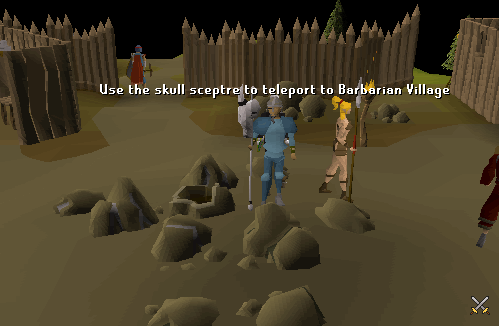 Use the skull sceptre to teleport to Barbarian Village - Use the Skull Sceptre to teleport to Barbarian Village. It is made out of four different pieces which are each a monster drop on all four levels of the Stronghold of Security. After completing every Hard task, you can return to Vannaka to get rewarded for your achievements. lf you ever lose your armour, simply talk to Vannaka to get it back again. 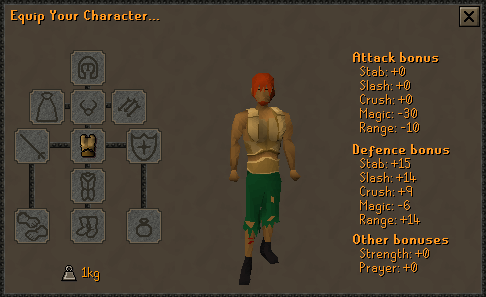 Vannaka will give you the Varrock Armour 3 . When smithing at the furnace in Edgeville and wearing the armour you have the chance of smelting two bars at once up to and including Adamant Bars. 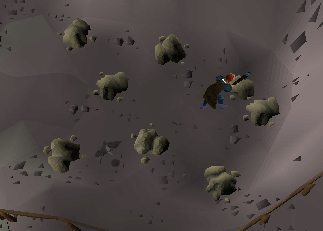 When you mine while wearing the armour, you get the chance of mining two ores at once up to and including Adamant Ore.
You get access to the bank area within the Cooks' Guild. 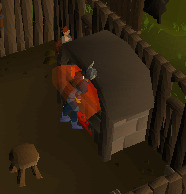 The armour can be worn into the Cooks' Guild instead of the usual Chef's Hat. An Antique Lamp which will give 10,000 experience to a skill of your choice at least level 50. 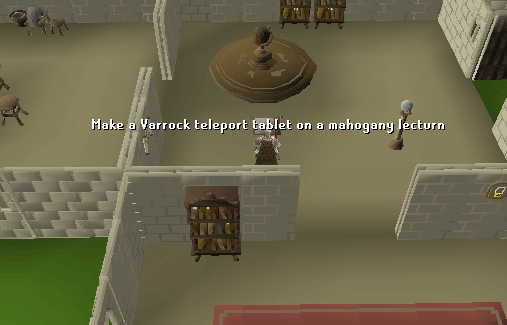 Ability to speak to Vannaka to change your Varrock Teleport location to the Grand Exchange.